I hope you all had time to celebrate our Beloved Rayaru Pattabhisheka and his birthday and Pushya Nakshatra on Sunday. PS: These dates are based on India time, festival dates may vary in other parts of the world. Vilambi Nama Samvatsara is finally coming to an end. 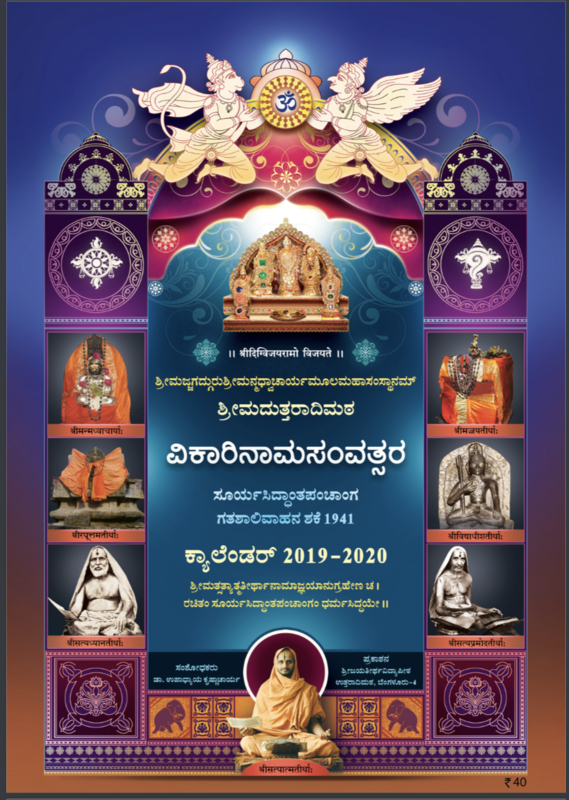 The new year Vikari Nama Samvatsara for all of us starts on April 6th 2019. The new year calendar has already come and hope you all had a chance to buy the same. I am posting a few important dates just so you can all have it handy for the new year. As always, will post details about festivals, important dates as and when it approaches. Will update post 2020 later. Hope this helps you all for a quick reference. Very helpful post by Ms. Meera. I regularly visit your blog to know many important dates. Also please post a video of your pooja vidana, I would like to know how you prep and what to start first, and how finally pooja is done. Thanks a lot. Meera, Thank you for the useful info. In Atlanta, the divine Srinivas Kalyana is performed on Sunday. Hope all the devotees from Atlanta can participate in the celestial wedding of Lord Venkateshawara with Goddess Padmavathi. Thank you very much Meera avre. Really you are doing great job by posting all these details for our information. Thanks Geetha. I am doing good.